For years, frogs have been held up as a prime example of what can happen to a species when its environment was polluted. Frogs with no legs, frogs with extra legs, frogs with all manner of deformities were plucked from ponds and held up as examples: “See? This is why we need to clean up the environment!” As a researcher, Brandon Ballengée was one of those scientists, combing the lakes and ponds alongside biologist Stanley Sessions from Hartwick College in New York. These days, he takes what he knows, frogs, and turns it into weird works of art. 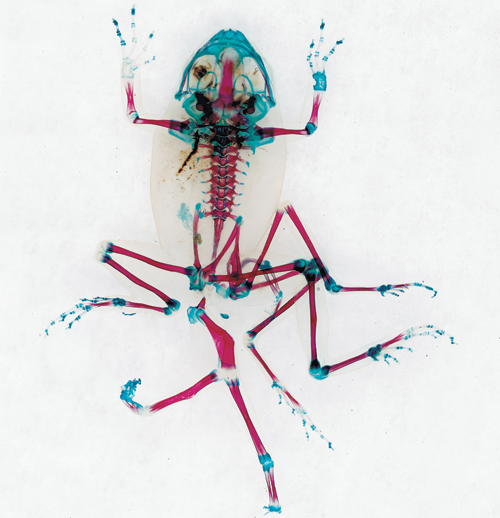 Using dyes of various colors, Ballengée has created the photograph series, “The Case of the Deviant Toad.” He takes dead frogs, pumps them full of dyes and chemicals, and documents their deformities in startling, otherworldly photographs. The particular blend of art and science caught the eye of science-art group Art Catalyst, who are sponsoring Ballengée’s show at the Royal Institute in London. As for the frogs, it turns out most of their deformities are natural. Natural parasites burrowing into the limbs of the tadpoles causes their froggy body to overcompensate, growing extra legs. Missing limbs are the work of leg-eating dragonfly larvae. Pollution had nothing to do with it!